We survived Still Hungry so 5 stars. All you losers who died and lost deserved it. When the zombie uprising happens, just stand outside and be food. 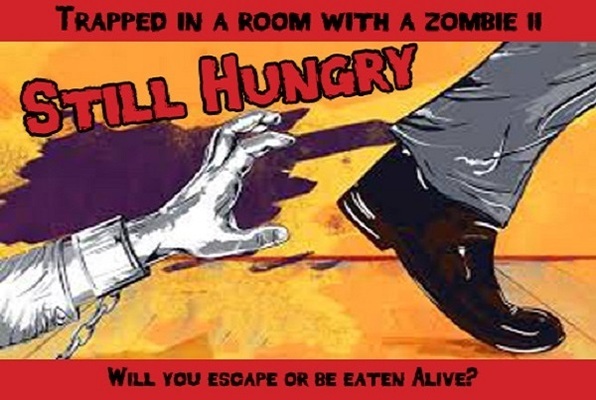 Welcome to the second edition of Trapped in a Room with a Zombie! It will force you to think quicker and communicate faster than ever before! The strategy of “Divide and Conquer” will prove helpful when solving Dr. Oxy’s challenges. Reviews of escape game "Still Hungry"
We just got back from "Still Hungry" after doing the original room several months ago (In Boston area). Both were excellent! We didn't make it out of the first one but we got out this time with 2 minutes to spare! Everyone had a great time and we were especially impressed by the actors. This is a well-organized event and I feel it is just challenging enough to have a real possibility of solving it in the given time frame without being too easy. My husband and I went with 6 of our friends to Still Hungry, after having done the original room, and LOVED it! Very challenging, exciting mind games that were a great friend or team building time (even for folks that have been friends for a while like us)! Go! Not scary, just fun!